If seeing Jackie Robinson's Hydrangea Blue collection has put you in a spring kind of mood, you'll enjoy her virtual trunk show today. 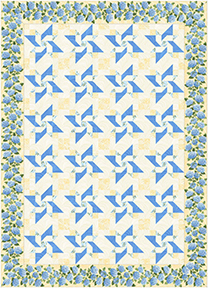 Jackie is featuring her fabric in five quilt patterns and has also designed a free quilt pattern available on our website. "Easy Trip Around the World"
This quilt is made up of nine-patch blocks--what we used to call fancy nine-patch blocks. It works really well to make a Trip Around the World quilt. And the stripe border just finishes is nicely. 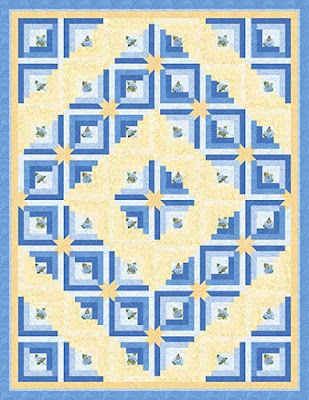 Click here to purchase the Easy Trip Around the World pattern. This is avariation of a Colorado Log Cabin, with stars in some of the corners. 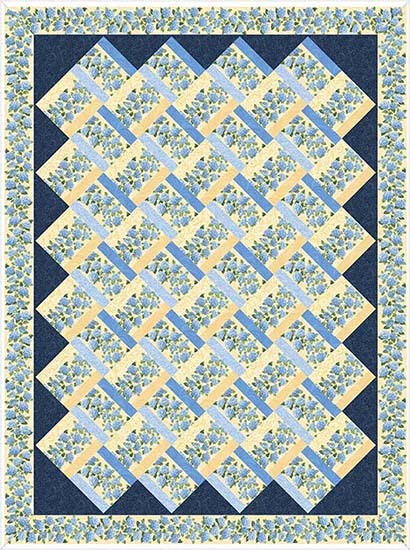 The different values of blues show up really well in this quilt. The center of each block features a fussy-cut hydrangea. Click here to purchase the Midnight Sky pattern. 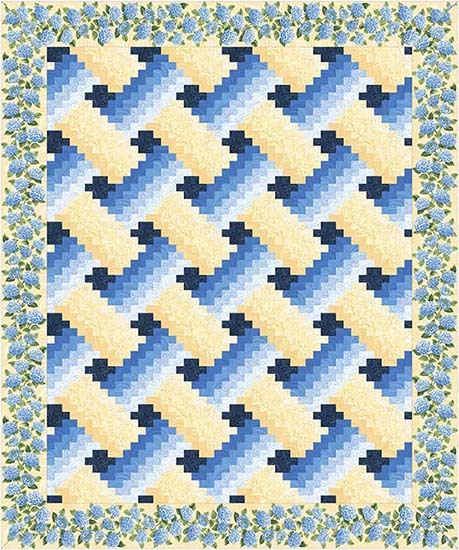 This is a Block of the Month quilt. It has five different kinds of blocks, so with assembly, it becomes a six-step BOM. 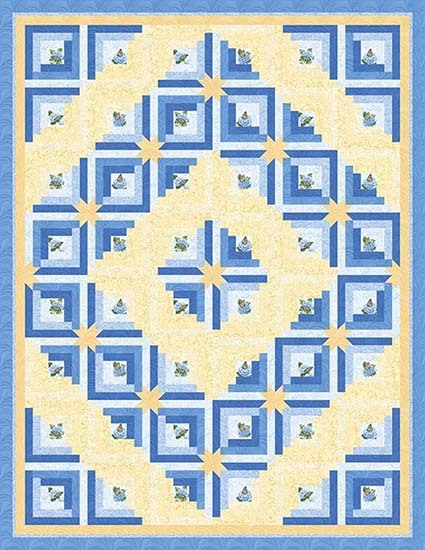 It's a medallion-style quilt that is assembled in an on-point setting. There are little star flowers in the center and near the outside. I like this one alot. 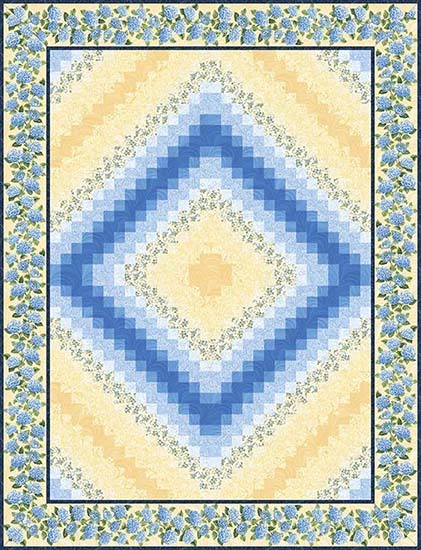 This quilt is one of the reasons I like to have four values in my fabric collections. It's one of my favorite quilts. It's made from strip sets, sort of a bargello technique. 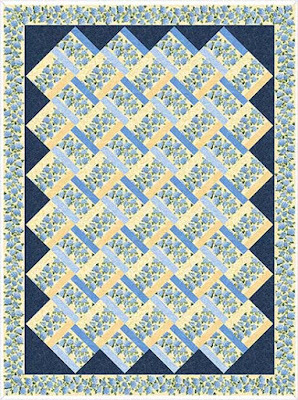 This quilt is so simple; it's a stripe flanked by two tonal strips. 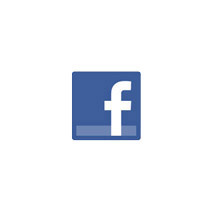 It looks more complex than it is. Click here to purchase the Woven Garden pattern. 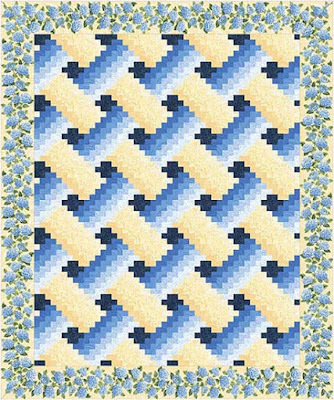 This is a unique quilt block made using snowball corners and half-square triangles. The yellow four-patches create a subtle secondary pattern in the background. There's a lot of spin in this quilt! 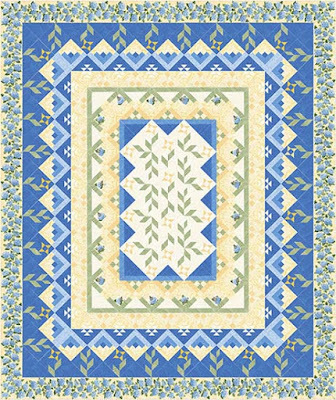 Click here to see the entire Hydrangea Blue collection. 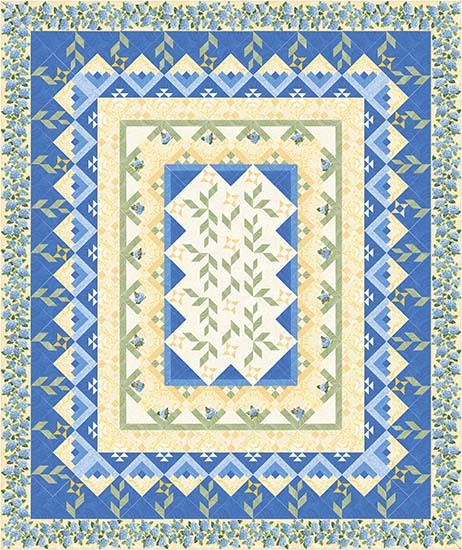 Click here to read an interview with Jackie about Hydrangea Blue. Click here to visit Jackie's website and find her patterns. Blue and yellow, one of my all-time favorite color combinations! Simply gorgeous!